It's a safe bet that no member of Congress has ever given a speech proudly endorsing a bill to close mom-and-pop businesses, hurt low-income shoppers, cause libraries to discard children's books and ban products ranging from dirt bikes to ballpoint pens. Last year, Congress overwhelmingly passed a law that did all these things - forcing small businesses to close and punishing manufacturers, retailers and consumers. Yet the Consumer Product Safety Improvement Act (CPSIA) became law with few warnings - and no congressional floor speeches - about the serious economic harm it would cause. To be sure, the CPSIA came in response to the public's legitimate concern about dangerous toys and products, especially those contaminated by lead paint. Reports in 2007 produced a media storm and political pressure. Manufacturers and retailers alike welcomed increased funding and staffing for the CPSC. But Congress went further. The law mandates expensive, destructive products testing. All products intended for children 12 and younger must meet new lower-lead-content standards. All children's products also must include a permanent tracking label. The first to discover the crushing impact of the law were makers of hand-crafted toys and baby clothes. These small companies and home-based businesses often emphasize their use of natural dyes and other organic components. Demand soared in the wake of reports of dangerous toys imported from China. Then the CPSIA delivered its blow. At a Capitol Hill rally in April, a representative of the Handmade Toy Alliance detailed the impact. Jill Chuckas of Stamford, Conn, related how the children's clutch ball her Crafty Baby company sells for $16.50 would cost $1,500 to test - a test that destroys the product. These same "safety" standards and testing requirements apply to used children's clothing, toys and pre-1985 books (potentially printed with lead-containing ink) sold or distributed secondhand. Unable to bear the testing costs and unwilling to risk the legal liability, many thrift stores are simply emptying their shelves. Libraries and used-book stores have packed away children's books. The April rally also brought home the impact on motorcycles, snowmobiles, all-terrain vehicles and bicycles. Certain metal parts - AZ battery terminals, for example - are made of alloys that contain minute levels of lead. No realistic possibility exists that children will consume the parts, but the CPSIA still bans them. The Motorcycle Industry Council estimates the law could cost manufacturers and retailers as much as $1 billion annually in lost inventory and sales. There's an individual impact, too. At the rally, champion Motocross rider Rod Yentzer said his family rides 52 weeks a year, but parts are getting hard to come by, threatening the family pastime. He then turned the podium over to his 6-year-old son, Chase. "Please let me have my dirt bike back, and I promise I won't eat my dirt bike," Chase said. Earlier this month, the law hit yet another target: ballpoint pens. The pens are made with metal points that contain minute amounts of lead. They could never legitimately be considered a health risk, but the CPSC made it clear: Pens targeted for sale to children are banned. Bound by the law's unambiguous requirements, the CPSC has rejected industry requests for exemptions. Instead, the commission has granted stays of enforcement - in effect, offering to look the other way for a year or two. "The CPSC is buying you some time in which to go out of business and/or retool your production to meet their standards," commented Sarah Natividad, owner of Curious Workmanship, who produces handmade baby booties in Tooele, Utah. "They don't have the authority to rescind the Catch-22 in the standards, so they're doing the best they can." Ms. Natividad is one of scores of owners of small, home-based businesses who have turned to online social networking to push Congress to reform the CPSIA. Unfortunately, no legislation is moving; some members have deflected the growing grass-roots criticism by blaming the CPSC's current leadership. Last week, the Senate unanimously confirmed President Obama's nominee to chair the CPSC, Inez Moore Tenenbaum. Ms. Tenenbaum is well-qualified - a lawyer, former South Carolina superintendent of education and a 2004 Democratic candidate for U.S. Senate. Business and consumer groups urged her quick confirmation. Still, Ms. Tenenbaum is being put in a difficult position, asked to enforce a flawed law that is destroying businesses and depriving consumers of safe and useful products. Her tasks ahead include not just regulation and enforcement, but persuasion. She must convince Congress of what is already painfully clear to businesses large and small: It's time to fix the Consumer Product Safety Improvement Act. Carter Wood is a communications adviser for the National Association of Manufacturers. 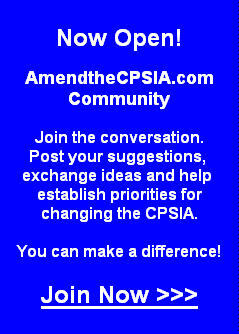 CPSIA - What Does Canada Know (That We Don't)? Our friends to the North have been following developments under the CPSIA, and in a race to the bottom, decided to implement their own version of our new safety law restrictions. However, to their credit, Canadian regulators chose to carefully and sensibly limit their bans and have thereby introduced focus and rationality to their scheme. What an innovation! Canada has apparently decided to ban the notorious six phthalates. As I have written on several occasions, it appears that the science behind the fears of phthalates is unclear at best. That being said, I have never opposed a ban on phthalates for the most vulnerable class of consumers, namely children under three. This ban was implemented by the EU years ago, with years of forewarning (REAL forewarning, Mr. Moore, not requiring telepathy) with a limited focus on products for the "Under 3's" and was accommodated by industry with barely a peep of pushback. Canada seems to have learned from the EU, and bans the chemicals only in soft vinyl toys and childcare articles. This narrowing of the ban makes it consistent with the EU regulations and makes it much easier for industry to accommodate. It is also arguably better focused on what may be the only safety issue with phthalates. It was Canada's intention to correlate its rules with the EU. Needless to say, the Canadian regulators did not have to contend with a different legislative scheme in California or the City of Chicago or whatever. They set a central policy for everyone. On the subject of lead, the new Canadian rules take the U.S. rules and add sense to them. The new lead limits are for products suitable for children under three (not based on intent but on objectivity) and also on products intended or likely to be placed in the mouth. Frankly, this is hard to object to - as it is any responsible company's obligation to take reasonable measures to protect its customers, particularly the most vulnerable ones. This precautionary measure would not be problematic in my view, as it is entirely limited to the class most likely to be adversely affected by the (possible) hazard. Our rules do not permit this kind of focus or devotion of resources. The age limits of the CPSIA applies to everything but the kitchen sink. This is a major source of strife under the U.S. law. It is also notable that our rules are made even more unpalatable by the extraordinarily coercive liability rules imposed by the (ridiculous) CPSIA. I cannot over-emphasize the dread I personally experience when I have to deal with ANY quality issue nowadays. The specter of liability is constantly on my mind - but notably it does nothing to affect my judgment on what's the right resolution of a quality issue. It just raises my blood pressure. If you are a consumer advocate, you may be rubbing your hands in glee, but I would caution you against too much exuberance. If you make it miserable enough for manufacturers to ply their trade, they'll go elsewhere. Is that really what you want from us? Our companies are world leaders in hands-on learning. Does the world have an oversupply of good educational companies, particularly focusing on early education? Not in my opinion. Btw, I hear about other people's dilemmas under the CPSIA from time to time. The liability clouds are changing behavior in the community of companies serving children's markets. Either the companies are shifting away from their traditional markets to avoid the hassle and tight noose of this law, or else they are simply ignoring it. Do you get it? The response of many companies is to IGNORE the new law. Question: Isn't ignoring the law how we got in this mess in the first place? Great solution, guys! Please call me when you are ready to talk sense. "From the standpoint of the consumer, enforcement of the law as written by the Congress would limit the availability and increase the costs of a product that is almost synonymous with childhood. But most importantly, because lead adds to the strength of the metal used and has other useful attributes, enforcement of the law could adversely impact the safety of children’s bicycles, leading to more deaths and injuries. A stay of enforcement is our only option to protect children. While the stay of enforcement will allow children’s bicycles to continue to be sold over the next two years, the stay also contemplates that manufacturers develop plans to reengineer their products to remove the lead from the metal used in children’s bicycles. In other words, we are requiring that manufacturers use scarce resources in challenging economic times to attempt to address a risk that children just do not encounter. It is very troubling that the commission has had to resort to using stays of enforcement to avoid the unexpected, and, in some cases, the dangerous consequences that would result from enforcement of the CPSIA. Such a result does not increase consumer confidence and creates uncertainty in the marketplace. There are those who would add that, at some point, regular use of stays opens the agency up to legal challenge for not enforcing the law." I hope someone besides me is listening to Ms. Nord (hello, Congress?). Her arguments deserve thoughtful consideration, notwithstanding that Mr. Bush appointed her. This is serious business. The laws that the CPSC is required to enforce matter a great deal to consumers and to our economy. Forcing the CPSC to enforce a terrible law with terrible incentives for industry has a predictable outcome - and not a good one. Perhaps our neighbors in Canada can help us sort out a direction forward. Walter Olson, the proprietor over at http://www.overlawyered.com/, has been covering the CPSIA with distinction since the beginning. I always enjoy reading Walter's column, and learn a lot in the process. [Full disclosure, Walter reads my blog, too, and links to it.] He just posted an update that was laden with great links and lots of useful information. I found the topics enraging all over again. Many aspects of this self-induced crisis are outrageous and cause me to have blood pressure incidents, but I cannot honestly think of anything more offensive than the impact of this stupid law on books. Walter provides yet more data that proves conclusively that books are being thrown away and that libraries are restricting access to books, all because of the genius law CPSIA. Tossing books away, restricting access to books and information, is antithetical to a society based on Freedom of Speech. It also happens to be a sin, not to make too big of a point of it. How would you feel if the law resulted in book burning? Isn't that a hot button in civilized societies? To me, book burning brings to mind Nazi Germany, not exactly a high point in the history of civilization. Someone please explain to me the difference between book burning and mass book discarding. Oh yeah, book burning is worse for Global Warming. Golly, Congress thinks of everything! Rob Wilson of Challenge and Fun, Inc. and http://www.cpsia-central.ning.com/ published an Op-Ed in Roll Call yesterday in reply to Nancy Cowles. In this article, Rob explains how the consumer advocate outlook on children's product safety harms small and micro businesses that have an outstanding record of safety. June 17, 2009, 2:25 p.m.
Nancy Cowles’ recent Mission Ahead piece, New Toy Regulation Act to Further Protect Children, resembles the new safety law she defends: overreaching and misguided. I should know. As a board member of the Handmade Toy Alliance, made up of small toy stores and small-batch toy and children’s product manufacturers from across the country, I am acutely aware of the onerous burdens our members now face as a result of the Consumer Product Safety Improvement Act. This alliance was formed in reaction to the threat the CPSIA poses to consumer access to our unique handmade toys, organic clothing and children’s goods. Despite Ms. Cowles’ implication that big money interests are leading the opposition to this law, our members are small or micro businesses, including many parents — even grandparents — who work out of their homes. Our members have based their businesses on safe, natural products, and our product quality and safety record is second to none. Ms. Cowles’ assertion that toys might actually be “toxic” smears our years of hard work making safe handmade toys and children’s products. By calling our integrity and good corporate citizenship into question, she irreparably damages our reputations by planting seeds of doubt with the general public. Her charges are groundless, but because Ms. Cowles dares us to prove a negative, we are forced unfairly to defend ourselves. We have been very supportive of risk-based testing. In contrast, the CPSIA creates a rigid regimen of testing that ignores risk and is unaffordable, particularly for small businesses. We have suggested a system of component testing, but the law permits the Consumer Product Safety Commission little flexibility to design such a system. It is a hallmark of the new law to leave the CPSC with no room for discretion. This is one reason for the numerous enforcement stays and stay requests — this is the CPSC’s only tool to blunt the impact of the new law. Likewise, the CPSC is no longer permitted to determine what presents a real safety risk. Is an organic cotton T-shirt really something we should worry about? If testing of T-shirts is enforced (as anticipated), many of our members will be forced to stop making them. Will anyone be safer as a result? I do not believe that consumer advocates set out to put our members out of business, but they have succeeded in creating the conditions for our demise. Retroactive application of the new standards against our inventory, unnecessary testing and the nearly impossible one-size-fits-all tracking label requirements are driving our members to shutter their activities in the children’s market. We are not the only victims of this law. It is well-known that resale shops and charities are closing their children’s departments at a time when there is a chronic need for these products. Sadly, politics has taken over the debate about safety. Those politics depend on branding children’s products as dangerous — and that makes our businesses an endangered species. Ask yourself if you will feel safer when you find your local dressmaker unwilling to make a custom flower girl dress for your daughter because of a “safety” law or when your nephew can’t get the special-needs educational products he needs. While Ms. Cowles accuses small businesses of “hindering progress” under the new law, nothing could be further from the truth. The law itself has done plenty to hinder progress by paralyzing the CPSC with unrealistic deadlines, conflicting priorities and inflexible requirements. Real progress will only happen when the CPSC has the right and ability to focus its energies on real product safety risks. We have previously reached out to consumer groups, and we renew our call for consumer advocates to join us in urging Congress to make common sense changes to the law. There is reason for hope. Congress can still change this law to stop the carnage. We are hopeful that CPSC Chairwoman-nominee Inez Tenenbaum will lead the way. Congress needs to restore sanity to safety administration by allowing the CPSC to regulate based on risk assessment. The days of deciding whether library books or ballpoint pens present a mysterious danger to the public must come to an end. Our right to make handmade baby teethers and wooden pull toys must be reinstated. Rob Wilson is vice president of Challenge & Fun, an importer of natural toys, and a board member of the Handmade Toy Alliance. Yesterday's confirmation hearing for Inez Tenenbaum was both predictable and in its own way, compelling. [Please note that the webcast video begins at about 20:41 - there's nothing wrong with your computer!] As anticipated, Ms. Tenenbaum displayed a rational outlook and outgoing personality that seemed to sell well with the Senate Committee. It was something of a love-in, which is not surprising for a long anticipated, shoo-in Obama appointee. Of course, the going may not be quite as easy in the future, as one Senator warned. But for right now, all is right with the world for the confirmation of Ms. Tenenbaum as the new CPSC Chairman. In her written testimony, Ms. Tenenbaum attempted to set a cooperative tone. She not only mentioned the need to collaborate with the Senate Committee, but also with consumer groups and industry. She stressed the need to reach out to industry in both her written and oral testimony. At the same time, she paid homage to troubling aspects of the new law by, for instance, pledging a rapid implementation of the defective product database. The database as presently conceived is exposed to serious problems, like faulty or even false postings by well-intentioned consumers or even unethical competitors. Businesses will bear this burden uneasily and small businesses will certainly take their lumps. "Guilty until proven innocent" remains the theme song of the CPSIA. Ms. Tenenbaum's testimony lent credibility to the notion that certification of testing labs will accomplish something. What that "something" is has never been clarified to my satisfaction. I do not believe the accreditation of labs or lack thereof has any link to product safety. There are NO cases of unethical or false test reports connected to product recalls to my knowledge. I have no reason to believe that government supervision of testing labs is anything more than a new bureaucracy raising costs without bringing new value. I wonder if the CPSC knows what problem they have been charged with solving by accrediting labs. Somebody should let me know if they figure it out. a. Senator Pryor's opening remarks in which he advised that unfortunately there has been "a lot of controversy about the implementation" of the CPSIA but "most of that has been resolved at this point . . . there are still a few outstanding issues . . . ." I am quip-less, evaluate this remark for yourself! Notably, Senators from both sides of the aisle were civil and calm in their discussion of product safety for a change. There was wide bipartisan use of the term "common sense", which I hope is code for an acknowledgement that the legislative scheme needs to be fixed. It was nice to not see fangs bared for once, and to not feel like a social outcast just because we happen to make children's products. Let's hope this new civilized atmosphere can be sustained, and that a rational discussion of the issues under this law can be productively fostered. b. Ms. Tenenbaum made a point of stating her consistent practice of implementing the laws sent her way by legislatures. I am sure this was a good seller on the Committee but I hope she exercises a bit more independent judgment with regard to the CPSIA. To her credit, she dodged questions about the law itself. This is entirely appropriate, of course. She noted the need to confer with her other Commissioners, and would presumably also be very interested in the opinions of her highly-qualified professional staff. Perhaps after those conversations she will be a bit more opinionated. c. Senator Pryor invited Ms. Tenenbaum back in "60 days" to give the Committee an update on how her work is going. Unfortunately, 60 days after June 16 is August 15, ONE DAY AFTER tracking labels and the new lead limits become effective (the lead limits effective retroactively). August 15 is also in the middle of the summer recess of Congress . . . . Let's hope they find a way to chat sooner than that. Relief is needed urgently on tracking labels (at a minimum) before August 14. It was encouraging that Ms. Tenenbaum highlighted industry's concerns over tracking labels in her oral testimony. d. I was disappointed that Ms. Tenenbaum didn't have a stronger answer to Senator Pryor's question about staff morale. To me, the question of morale is THE key question she had to answer at this hearing. Bob Adler explained the issue clearly in his keynote speech at ICPHSO in February. There is a brain drain going on at the CPSC. Why is morale so low? It seems inescapable that low staff morale has something to do with public pillorying of the agency, a year long permi-crisis creating unrelenting and untenable workloads, and a terrible law that forces the agency to spend its limited resources on unimportant things in lieu of focusing on real safety issues. [For example: accrediting testing labs, processing stay requests on pens and other obviously safe products, and assessing the "risk" posed by library books.] Ms. Tenenbaum needs to assess the root causes of the agency's brain drain and morale issues quickly. Lots of money to hire more staff won't solve the problem entirely. The staff believes in the agency's mission, and the CPSIA takes them far away from it. Ms. Tenenbaum must lead everyone back to sensible safety regulation and administration. e. Another worry: Ms. Tenenbaum's apparent conviction that many problems under the CPSIA will be resolved with more guidance and the issuance of final regulations. Perhaps some issues can be resolved that way but most won't, like tracking labels, resale shops' legal liability under the new law, the cost of safety testing, the need to self-report for every conceivable violation of the law and the confusing state of competing regulatory agencies (CPSC versus 50 SAGs). Interestingly, Ms. Tenenbaum stated that the stays were "working" and that fewer stays will be necessary as new guidance is issued. I hope the subject of how well stays are working is on her investigative agenda when she starts her new job. I would further note my longstanding concern that the new regulatory scheme is so complex (and therefore inherently difficult to administer) that it cannot be effectively taught. Under these circumstances, it is predictable that most if not all companies will be routinely violating the law. In other words, regulators will have their choice of enforcement actions with almost every company making children's products. This might result in a rather coercive situation if the CPSC shows up on your doorstep. If the agency defaults to handing out big penalties for all those violations, many people will vote with their feet by leaving the industry before it happens to them (this is already happening). If the CPSC chooses to not enforce the law or to selectively enforce it, respect for the law will be damaged and an uneven and unfair administration of the law will result, a very unstable situation. Given these problems, it is absolutely necessary that the law be changed to something that can be enforced - comfortably for all concerned. f. I was not paying much attention to the issue of Chinese drywall, a big issue for Ms. Tenenbaum and the agency but not for me. I will say, however, that the fantasy endorsed at the hearing that a local CPSC presence in China would somehow prevent this problem seems naive and possibly dangerous. As Gib Mullan noted at the tracking labels public meeting on May 12, the agency is not always aware of risks before they occur - and specifically pointed to drywall which had been a very inert product for decades. Unless the new CPSC office(s) in China are staffed with mind readers and perhaps Carnac the Magnificent, there is little reason to believe they would be capable of preemptively spotting an issue like the Chinese drywall problem, AquaDots or whathaveyou. Here's a crazy idea for you: why not put the burden for product quality on . . . (get ready for it) the importer. Yes, the U.S.-based company that imports the drywall, whose entire business life is oriented around drywall, why not stick it to them for the drywall problem? Is it simply politically expedient to blame the nation of China for the actions of one or more businesses operating incompetently or worse in their midst? I personally think the OBVIOUS solution to these latent defects is to place the burden on the importers. The CPSC previously had no reason to become involved with Chinese drywall and is in no way culpable for its importation or use. Not everything that goes wrong in society is the fault of Mother Government. I still believe individual responsibility can be an appropriate part of our regulatory scheme. The confirmation of Ms. Tenenbaum is expected to proceed on a fast track and culminate in a "yes" vote within days. We have a lot to look forward to with the new Obama appointees. Here's hoping for a long and successful career for Inez Tenenbaum as a healer and a leader of a very important regulatory agency. My friend and associate, Carolyn Voisin, President of Roylco, Inc. of Anderson, South Carolina, wrote the following Op-Ed which appeared in The State, a prominent South Carolina newspaper. In this Op-Ed, Ms. Voisin describes the path forward for Inez Tenenbaum as new Chairman of the CPSC. S.C. businesses serving the children’s market — and thousands of similar small businesses across the country — are eagerly awaiting Inez Moore Tenenbaum’s confirmation hearing and Senate approval as the new chair of the Consumer Product Safety Commission, hoping that she will act decisively to fix the well-known problems with the new Consumer Product Safety Improvement Act. The children’s product industry, already suffering from an historic economic downturn, has been hurt by the over-reaching provisions of this new law, and needs Ms. Tenenbaum’s leadership to stop the damage. I should know. Our family business makes educational products for schools. Although our company has a sterling safety record over more than 40 years of manufacturing — 13 of them in South Carolina — we now face an uncertain future with high costs from unnecessary testing and tracking labels that do nothing to improve product safety, and from exposure to new kinds of liability. This law will cost jobs in our community. The law was passed by Congress last year in anger over several high-profile recalls of toys because of lead paint. Since the law’s passage, severe unintended consequences have become evident due to its overly broad definition of children’s products, its unrealistic deadlines and its ban on the sale of existing inventory. Congress and the Consumer Product Safety Commission have pointed fingers at each other over these problems. Congress blamed former acting Safety Commission Chairman Nancy Nord, a Republican, for refusing to use the agency’s discretion in interpreting the law. Ms. Nord and her staff responded by noting the law’s unrealistic deadlines and inflexible standards that tied the hands of the agency. Commissioner Nord and her Democratic counterpart Commissioner Thomas Moore both agree that, ironically, the law takes away the agency’s ability to act based on its assessment of risk, and have voted together on almost every issue related to the law. The appointment of Ms. Tenenbaum provides the opportunity to focus new efforts on fixing the law. Ms. Tenenbaum needs to persuade Congress to restore the agency’s ability to make its decisions based on risk of injury. Under Ms. Tenenbaum’s leadership, implementation of the law should follow a new commonsense path. For example, children absorb more lead by eating snacks or drinking tap water than this law would allow them to be exposed to from such products as books, pens, bicycles, ATVs and many educational toys. Those products should be exempted from the law. The law currently does not permit the commission to take this position. The next crisis caused by this law will stem from the new tracking-label requirement. Intended to facilitate more effective recalls, this requirement instead is creating chaos in the marketplace. The commission hasn’t stayed or issued rules for implementing tracking labels even though the requirement takes effect on Aug. 14. Companies such as ours are now forced to guess about their new legal requirements. The burdens on small businesses are terrible. My company may have to change labels hundreds of times a week in our two factories. The investment necessary to handle this new rule alone is crippling. Ms. Tenenbaum should work to delay the tracking-label requirements until regulations can be developed that recognize a one-size-fits-all approach will not work. Since Ms. Tenenbaum is an educator, I am optimistic that she will take strong action to assure that a healthy market for educational materials remains available to serve our schools and children. Sadly, many important educational products are being eliminated from the marketplace because of high legal compliance costs and fear. One school has stopped using rocks for the study of Earth Science and instead will teach using a poster — all because of doubts over this law. Other companies have stopped selling electricity kits and microscope light bulbs — not for safety reasons but solely because of the impossibility of legal compliance with the law. It is heart-breaking to see this damage inflicted on our schools under the banner of “improved safety.” We need Ms. Tenenbaum’s urgent attention to the interests of our nation’s pre-school, elementary and middle school children before this law takes away their right to learn. Ms. Tenenbaum will do a great service to the country if she makes it a priority to fix the Consumer Product Safety Improvement Act. She can protect consumers and save thousands of jobs by taking a commonsense approach and restoring rationality to children’s product safety. Ms. Voisin is president of Roylco, a manufacturer of children’s educational products based in Anderson. In the latest issue of Newsweek, Peter G. Peterson credits Herb Stein, former Chairman of the Council of Economic Advisors in the Nixon Administration with the following quote: "If your horse dies, I suggest you dismount." Do you think he was talking about the CPSIA??? CPSIA - Nancy Cowles Attacks Me in Roll Call! What a nice compliment, I have been publicly attacked by name by a consumer advocate! In the wake of my my June 1 Op-Ed in Roll Call in which I documented the limited scale of lead-in-paint recalls in 2007/8 and dared to make the self-evident claim that our company does not make "toxic toys", Nancy Cowles, Executive Director of Kids in Danger, responded by tearing me apart in Roll Call on June 8. Talk about "don't kill the messenger"! While I resent the personal nature of Ms. Cowles' article and its misrepresentations about me as a person and as a businessperson, I am not surprised. The fear mongering attack dogs amongst the consumer advocates have been out and about for some time. In this space, we have faced "Joe Consumer" from ThePopTort.com, pointed out errors and misrepresentations in the Consumers Union blog, dealt with twisted facts by Jan Schakowsky and the like. The really aggravating part about this is that these folks can seemingly say whatever they want and not be held accountable. [That goes double for politicians - consider the galling fact that Rep. Jan Schakowsky has actually given a public address in which she personally attacked me by name and questioned whether I had kids! That's the kind of political "leadership" we are enjoying these days.] Who can challenge the saintly consumer advocate after all? With their purity of spirit and unquestioned good intentions, how can we doubt them? Thus, when they speak, they get the last word. By definition, they claim the higher ground and gaze down upon the rest of us. a. Ms. Cowles states: "Rick Woldenberg objects to the need to test children’s products for chemicals and other hazardous materials banned under the Consumer Product Safety Improvement Act. . . ." I have NEVER said that testing is objectionable. Our company has tested its products aggressively for two decades. As I have stated publicly, we have had ONE recall in 25 years for 130 pieces (out of an estimated 1,000,000,000 units sold) and recovered ALL of them. I assert that this excellent safety record could not be accidental, but instead is the by-product of a concerted and organized effort to behave responsibly. The issue with the new law is NOT that testing is required but instead that a LOT of wasteful and purposeless testing is required. We cannot afford to waste our limited resources on useless testing. Testing for lead-in-substrate is an absolute waste of money. Insoluble lead-in-substrate has not been demonstrated to cause injury. See for example my analysis of ATVs and pens. The health issue is in lead-in-paint and leaded jewelry - in other words, soluble lead. That's it for lead health issues in children's products. I have consistently taken this position. Testing for lead-in-paint is an old standard and an appropriate precaution for any responsible manufacturer. We have always done it and never objected to it. I have long conceded that this kind of testing is a good idea, and further, is a good response to the outbreak of recalls in 2007/8. Likewise, the cost of testing for phthalates far exceeds its value. I am not going to touch the issues relating to the ban on phthalates in this essay. I have written about it several times and am generally skeptical about its true value to consumers. To spend a fortune on testing for phthalates is ridiculous on two levels. First of all, phthalates are simply NOT a hazard unless you are chewing on the product for a longgggg time. [Remember, lead and phthalates are not radioactive - you have to ingest them to be affected, not just touch them or be near them.] This scratches most products off the list. Second, elimination of phthalates from products does not demand testing each individual item - effective elimination of phthalates depends on good supply chain control. I STRONGLY object to testing every item for phthalates but taking reasonable steps to assure that your supply chain is free of phthalates is not a problem. We can do that for little money. The premise of the CPSIA is that consumers will only feel safe if surrounded by stacks of testing reports reaching the sky - yet the experiences of 2007/8 in which large companies with well-known heavy investments in testing failed to keep defective products off the market (e.g., RC2, Mattel and RoseArt/Mega Blocks) suggests otherwise. Ms. Cowles, you have misrepresented my position. b. Ms. Cowles states: "Mr. Woldenberg states, “I don’t make ‘toxic toys,’” and we fervently hope that he is right." Is this fair? The implication of this remark is that she, and YOU, have good reason to doubt me and our company. In other words, our integrity is at issue here - which is shocking, frankly. What good is achieving our long record for safety if consumer attack dogs can freely take this kind of groundless pot shot? Ms. Cowles' commercial denigration is quite damaging to our reputation - and may be actionable. I wonder if Ms. Cowles is familiar with libel laws. Ms. Cowles goes on to incorrectly state that testing was never required. In practical effect, that statement is simply naive and incorrect. The market has imposed testing requirements for a long time - this is not just our experience, either. First, major domestic customers in many industries have required a broad suite of safety tests for many years. We provide these test reports as a courtesy (and as a by-product of our internal safety practices). [N.b., this is one reason why the challenge to our integrity is so grating - our industry is not comprised of ogres but instead people just like you, concerned about kids and safety and being a responsible corporate citizen. It is convenient for people like Ms. Cowles to tar everyone in the children's product industry with the same brush - this furthers their objectives and allows them to skirt the facts.] Second, as a company selling into Europe (we sell into more than 80 countries worldwide), we have long tested for compliance with EN71, the EU's toy safety regulation. We also test against standards in many other countries. Thus, everything in our line is routinely tested for many things, lead and other heavy metals included, and has been for a long time. The integration of the U.S. economy with the world economy makes this testing practice common in the children's product industry. Sorry, Ms. Cowles, you are WRONG. c. Ms. Cowles states: "He implies that 'consumer groups' have some nefarious goal of putting innocent toy companies out of business." Wrong. I have never made the absurd claim that any consumer advocate wants to put anyone out of business. Instead, I have claimed that consumer groups don't understand business issues and that their rigid position on safety WILL put many companies out of business. She confuses intent (cause) with effect. The effect is that businesses will die and products will be withdrawn from the market. It is her intention to have this ridiculous law enforced. She and her consumer advocate cohorts are responsible, whether they intended this effect or not. d. Apparently, Ms. Cowles does not understand the law she so fervently supports. She likewise does not understand the prior law. Her ignorance on this topic is not unique. Ms. Cowles states: "In support of his claims, Mr. Woldenberg references the numbers of recalls for lead paint and points out that there were no recalls for phthalates. In fact, the CPSC did not have the authority to recall a product for phthalates, no matter how dangerous it was to our children’s health." This is rich. Ms. Cowles is wrong - and in a funny way, she is also technically right. Let's look at the law. The prior law CLEARLY permitted recalls for phthalates. Under the Federal Hazardous Substances Act, the term "hazardous substance" includes "Any substance or mixture of substances which (i) is toxic" [Sec. 2(f)(1)(A)]. Under Section 2(g), "toxic" is defined as "any substance (other than a radioactive substance) which has the capacity to produce personal injury or illness to man through ingestion, inhalation, or absorption through any body surface." The FHSA defines a "banned hazardous substance" as "any toy, or other article intended for use by children, which is a hazardous substance, or which bears or contains a hazardous substance in such manner as to be susceptible of access by a child to whom such toy or other article is entrusted" [Section 2(q)(1)(A)] Under Section 4(a), the FHSA bans the sale of banned hazardous substances: "The following acts and the causing thereof are hereby prohibited: (a) The introduction or delivery for introduction into interstate commerce of any misbranded hazardous substance or banned hazardous substance." Thus, the prior law gave the CPSC the authority to recall anything that is considered toxic. Her statement is wrong. And her statement is somehow RIGHT, too. How so? Well, as has been previously documented, the CPSC investigated phthalates and concluded that they were not hazardous in toys. Having reached the conclusion that phthalates weren't toxic, the agency actually lacked the authority to recall products containing phthalates. They also can't recall other products that are not toxic, like Wonder Bread or tap water or library books. In this way, Ms. Cowles is technically correct. Congratulations for hitting the target accidentally! e. Ms. Cowles follows up her legal analysis of phthalates with an equally incorrect reading of the exemption process: "And for those products that may contain lead in a form that would not harm children, the CPSC has been given the authority to exempt products from the lead-limit rules — but only after manufacturers show that the products will not negatively impact children." Of course, this is flat out wrong. This subject has been beaten to death - it is in virtually every statement by the Commissioners after they refuse exemptions for innocent and safe products like pens, ATVs and bikes. If you don't recall this point, please reread Section 101(b)(1) in the CPSIA. The only exceptions allowed are for products that will not pass even one atom of lead into the body. The Commission has seemingly stopped issuing stays without a "competing safety consideration", so I would not hold out much hope for relief under this provision unless an unusual situation arises like ATVs. With advocates like Ms. Cowles promoting the false notion that the law provides common sense flexibility, false comfort is possible. More likely, the CPSC will be forced to continue to violate the Constitution and compensate for the stubborn refusal of Congress to repair this amazing flaw in the law. f. Ms. Cowles takes one last swipe at me and other vocal members of the children's product industry: "Mr. Woldenberg and his allies in the industry should stop hindering progress and let the CPSC do its job." I don't know whether to laugh or cry over this one. I fail to grasp the basis for this accusation. We are hindering the CPSC by doing what? Expressing our views? Explaining the impact of the law? Explaining the flaws in the law? Demanding that the CPSC follow the law (including the Constitution), not just the convenient parts? Defending our integrity and the safety of our products? Defending the future of our markets? Defending the right of children to learn in schools? Daring to disagree with Kids In Danger and other consumer advocate luminaries? The incivility of the attacks of Nancy Cowles should stand as a beacon for everyone contesting this awful law. Ms. Cowles thoughtfully drafted a document exposing her ignorance of the law, the products she irrationally fears and the market itself. The demagoguery is obvious. Readers, please don't forget whose country this is. It does not belong to Nancy Cowles alone. If the message of her essay does not represent your vision of America, it's time to stand up. Don't let fear mongering set the tone for our country. We are capable of marginalizing ourselves and our country's ability to compete - or rising above the nonsense. Take back your country before it's too late! a. GAO Pans Recall Bonds. The Product Safety Letter reported this week that the GAO had some not-so-nice things to say about CPSIA Recall bonds. The GAO's study of Escrows or Recall bonds is required by a little discussed provision in the CPSIA (Section 224). This brainwave is one of many massive overreactions in the CPSIA to a SINGLE NOTORIOUS INCIDENT, in this case the controversial failed recall of Simplicity cribs and bassinets. In that famous case, Simplicity went bust and the successor company (which bought the assets out of bankruptcy) refused to pay the liabilities associated with products sold by the predecessor bankrupt estate. [Btw, that is neither a surprise nor a scummy move - it would be the buyer's contractual right under the corporate law of all 50 States. If you always had to take liabilities with assets, many transactions would simply not happen (especially out of bankruptcy), and creditors would be much worse off - including people wanting reimbursement for defective products like the cribs and bassinets in this situation.] The new investors were not cooperative in a way pleasing to the Chicago Tribune or to various highly-strung members of Congress, and voila!, we are all now exposed to the risk of posting Escrows or Recall bonds. Very few companies fail to complete recalls for financial reasons. The GAO notes a grand total of 15 failed recalls since 1979 (30 years) in ALL product categories (fire sprinklers, cribs, wall heaters, gas grills, thermostats, worm probes (who wants to probe a worm, anyhow) and a pull toy). The principal reason cited was bankruptcy. The agency recalls hundreds of products annually. The CPSC would wilt under the burden of administering these bonds or escrows (for virtually no apparent benefit). The agency is ill-prepared for this responsibility and does not possess the skills needed for this finance-oriented function. Assessing which companies or products would need to be backed by bonds would be nearly impossible. There would be conflicts with other agencies with similar authority. And, my favorite, there are few sources for these financial instruments and they will be (and are) breathtakingly expensive. Even pricing the instruments was deemed by the GAO to be "especially daunting". The GAO, showing more sense that some arms of the U.S. government that come to mind, said it would probably be cheaper and more efficient for the CPSC to establish a fund to help out when those few recalls fail for financial reasons or because of bankruptcy. Nahhh, that makes too much sense - next idea! Of course, the GAO also noted that several consumer groups were passionately in favor of this provision because of various bad dreams they had recently about problems with imports. When confronted by the GAO with the various serious "unintended consequences" of this (ridiculous) proposal, the consumer groups again reiterated the urgent need for this provision to protect the public. Can you say "out of touch"? We can only hope that the GAO Report will get a close reading by the CPSC and Congress before yet another financial catastrophe befalls respectable children's product businesses. b. CPSC Refuses to Stay Lead Standards on Children's Pens. Earlier in the week, the General Counsel sent a letter setting out the Commission's opinion that most pens are NOT children's products. Then, in an exercise of supreme nonsense, the CPSC Commission deadlocked at 1-1 and de facto rejected a stay of enforcement on pens. The split featured Chairman Moore on the side of banning pens and against a stay, and Ms. Nord on the side of common sense. Enjoy the delicious irony, friends (especially the much maligned Ms. Nord, if you are reading this essay). The twisted logic is set forth in the advice letter of General Counsel Cheryl Falvey and the statements of the two Commissioners. It is hard to dignify this decision by crediting it with any logic or insight. Frankly, it is inane and provides strong evidence of the lunacy foisted upon us by this awful law. I have previously noted that it will take 475+ years of writing on your hand to absorb a microgram of lead from a ball point pen, less than the lead found in two pieces of hard candy. Thus, I find the subject of the application of this law to pens to be morbidly discouraging. The very thought that a safety law could be focused on miniscule lead content in the 0.5 mm diameter brass ball in a pen tip makes me doubt the future of our civilization. Even Chairman Moore seems to have some dim perception of this issue. He notes in his statement that children not able to use pens designed primarily for children (banned!) will just use "general purpose" pens presumably for the same purpose - writing or coloring. He notes that the same lead content is found in those pens (in all pens). He does NOT explain how to decide which pens are "in" and which are "out". [Those are the bedeviling questions that paralyze businesses under the CPSIA.] In any event, Moore focuses on pens as playthings, not as writing implements (whatever that means) and on the grounds that banning pens would not itself create a worse safety problem, states that he sees no ground to grant a stay of enforcement. Thus, he seems simultaneously aware AND oblivious to the fact that the vast majority of pens used by children will have lead OVER the limit, because the CPSC opened up a giant loophole for general purpose pens. And the purpose or benefit of regulating the remaining pens is . . . what? What relevance is his "competing safety considerations" in this situation? Chairman Moore, perhaps to give comfort to the business community, apparently decided on a Solomonic resolution with a classic mixed message - see if you can understand it. Having denied a stay of enforcement, Mr. Moore then states: "[The pen manufacturers'] other alternative is simply not to make . . . pens with excess lead that appeal primarily to children. In the meantime, while I do not expect the agency to turn into the "pen police", manufacturers, retailers and distributors should police themselves as we move toward a marketplace where lead in children's products is dramatically reduced." Get it? You have to get the lead out by not selling pens with lead over the limit; the CPSC will not stay enforcement but will not enforce the law and you manufacturers should police yourself as you move from making non-compliant products to making compliant products which you acknowledge you cannot make. Clear as mud! I know I am just a killjoy (my wife has a saying, "Every party needs a 'pooper' which is why we invited you!") . . . but am I the only one who sees an issue with turning our safety laws into an unintelligible mish-mash jumble? Has Mr. Moore ever, for even a nanosecond, given a thought to what he would do if he had a job running a company attempting to comply with this mess of a law? Exactly HOW is a pen company supposed to interpret this law? You cannot make children's pens that violate the standard and the agency won't stay enforcement - but then again, the agency won't become the pen police and you should police yourself as you continue to make products that violate the standard. By the way, the CPSC knows you are making pens that violate the standard but don't worry about it. How do I explain this "rule" to my customers? [To anyone?] What is the answer Mr. Moore wants me to give to the eager beaver dealer who tests my children's pen and reports that it failed the standard? Am I allowed to sell it or must I turn myself in to the CPSC (the pen non-police)? I know what I think the answer is - yes, turn yourself in and expect to receive advice from the CPSC that you cannot sell the pen. See my analysis of the Potato Clock - it's exactly the same situation. Boy, am I glad I don't make this kind of pen. I am also offended that this idiotic law has hijacked safety administration in this country. We now must put on stern faces and THINK ABOUT whether a pen tip could reduce IQ points. This is beyond stupid - but the law requires that we focus serious resources on this kind of thing. I find it embarrassing to think that such an analysis even needs to take place - the CPSIA is the ultimate anti-common sense law. As Ms. Nord states, "The Commission needs to spend its resources focusing on products that actually harm children, not chasing speculative harms that are not relevant to the real world." Hear, hear! It's a terrible shame that Ms. Nord's voice was silenced by self-serving politicos and operatives more intent on crushing Republicans than making our children safe. Perhaps by now it has become clear to all that safety was never the real goal of this law. As noted yesterday, the data on phthalates from recent studies challenges the panic-stricken construct of California or Federal legislation banning of six (or in the case of CA, seven)phthalates. Reasonable doubts about the consumer advocates' position on these chemicals make the astounding losses from contraband phthalate inventory all the more painful. Now comes a new study from New York that provides evidence that animal abnormalities from (high) doses of phthalates are not being seen in humans. In other words, in this study of congenital defects in New York State births from 1992-2005, the authors could not find evidence of correlation to any risk factor other than advanced maternal age (whatashock). Animal abnormalities were not replicated in humans from exposure to phthalates. Hmmm. Digging deeper, a recently updated article by STATS (according to their website, "a nonprofit, nonpartisan research organization affiliated with the George Mason University") indicates that according to the National Institutes of Health, the majority of phthalate intake is from . . . food (meat and fish), responsible for 85-90% of intake in adults, and 45-60% in infants, the rest from dust. Toys as a source of phthalates is seemingly deemed by STATS to be minimal, just as the NPR article and audio clip contends. Not surprisingly, STATS confirms that the fear in the streets over phthalates derives from one questionable report by one ardent scientist. The STATS article calls much of that study into question, and presents considerable data which correlates to the CPSC study discounting the risk of phthalates found in toys. They also note that the media has not picked up on this one yet - maybe good news doesn't sell papers??? Perhaps we have all been so assaulted by movies about dread diseases and evil corporate conspiracies that we are now prone to believe the worst of everything and of everyone. One scientist with a passionate distrust of a substance can sweep up a lot of support from conspiracy theorists with a prejudice against business. There is also a strong distrust of scientific pushback on these "discoveries". By using accusations of conflicts of interest to marginalize dissent, fear mongers are able to exploit these questionable studies to promote legislation like the CPSIA (or even Mr. Waxman's dream legislation, the Kid-Safe Chemical Act, designed to change all regulation of chemicals to "precautionary"-style, just like our old friend the CPSIA). The conspiracy theorists can only hold sway over your country and your society if you let them. This is your country and your Congress. Hold them to account. I wanted to be sure you saw the CPSIA Op-Ed below published in Roll Call on June 1. In this article, I call for a return of risk assessment to the CPSC. Under the CPSIA, the CPSC had its hands tied and under pressure from Congress, had to resort to a series of increasingly unjustifiable stays of enforcement in an attempt to restore a semblance of order to the marketplace. In this new environment of officially-sanctioned noncompliance, the new law is losing its meaning, and those of us in the business community are being sorted into the “have’s” and “have-not’s”. This is no way to run a country. I have also attached a recent article I wrote for the Journal of Commerce about the tracking labels mandated by Section 103 of the CPSIA. This noxious provision alone will cause widespread devastation in the children’s markets and will provoke a massive die-off of safe products if nothing is done by Congress or the CPSC. In addition, I attached my testimony to the Subcommittee on Investigations and Oversight of the House Committee on Small Business for the May 14 hearings on the CPSIA. The Small Business hearings documented the severe problems caused by the CPSIA in the small business community. In my written testimony, I set out the various unsolvable small business problems caused by the CPSIA and make recommendations for fixes. The problems manufactured by Congress in the CPSIA impacted thousands of small businesses at a time of remorseless economic crises – but prompt action to repair the damage could be effective. Congress must acknowledge these mistakes and move forward to repair the CPSIA. It is now well-established that children’s safety is not dependent on the draconian strictures of the CPSIA. Likewise, the fatal flaws of the CPSIA have been clearly demarcated and can be amended without sacrificing children’s safety. With the appointment of Chairman Tenenbaum, the CPSC is ready to accept full responsibility for administering children’s safety again. To stand idly by is unacceptable and is increasingly disillusioning to your electorate. I call on Congress to act promptly to bring relief to the children’s market from the defective provisions of the CPSIA before more irreversible damage is done. To burden the new Commissioners and new Chairman of the CPSC with a faulty law will only further hobble a critical resource of the federal government. For regular updates on the CPSIA and its impact on businesses and consumers, please follow my blog at http://www.learningresourcesinc.blogspot.com/ or via Twitter at www.twitter.com/rwoldenberg. Lenore Skenazy (of Nightline fame) was kind enough to post this guest blog of mine. a. Labeling toys "toxic". This slander depended on the simple observation that lead-in-paint (which contains soluble lead) is capable of harming children. That much is not in doubt. Of course, the most significant source of lead in children's bloodstream is also well-known to be house paint, as well as environmental sources (air, water, dirt). The number of injuries or even suspected injuries from LIP on toys is insignificant compared to other injuries from lead in house paint or from environmental sources, and even less significant when compared to other kinds of childhood risks of injury (such as swimming pool accidents). If toys are "toxic", so are many other things we encounter every day, including swimming pools (FAR more toxic). Have labeled toys "toxic" with scant pushback from the Toy Industry (yes, my industry), these stalwarts of consumer protection kept going, extending the slander to all things children. It was also a perfect time to lay blame on China as though the failures of various private businesses in China constituted an attack on our way of life by a foreign government. A law which probably should have been restricted to toys was extended to ALL products intended for children (with a strongly implied focus on China). This scheme opened the floodgates of "unintended" problems. The assertion that the use of lead could not be justified in children's products was never challenged - the fear factor was too intimidating. The more the slander of "toxic toys" was repeated, the greater the fear engendered and the more the debate shifted from safety to an emotional response to panicky fear. b. Following San Francisco's example on phthalates by disregarding CPSC research on phthalates. The CPSC has completed detailed studies of phthalates that raised sonsiderable doubt about the risks involved in phthalates. Congress chose to ignore the CPSC studies in lieu of the California anti-phthalates model. After all, the House is controlled by a Congresswoman from San Francisco (Nancy Pelosi) and the House Energy and Commerce Committee is controlled by a Congressman from Beverly Hills (Henry Waxman), so no surprise there. The choice to limit the restriction to young children likely to be exposed to chemicals even slightly in doubt was also rejected, despite strong human factors evidence to the contrary. Fear again was the mechanism to build the bipartisan consensus in an election year. Rep. Cliff Stearns used strong language about the mistake of outlawing these chemicals at the April 1 Rally. It would be interesting to know how many Members of Congress can explain why phthalates are "bad" or what the difference is between the six phthalates in question (or in the case of California, seven)? Do any of these people know what the alternatives are, and whether they are better or worse? There is no need for a mastery of the facts if the object of the law is to assuage fear and make "heroes" out of Congress. Consequences, schmonsequences. Does the use of fear as a way to motivate change in law and legal process remind you of anything? How about Senator Joseph McCarthy and his list of Communists in the State Department? Nothing could have been more fearful than Communism in the Fifties. Joe McCarthy was building his career toward becoming your President, using fear based on fabrication. It was a low point in American history. Are we living it again? I recently read the book "Blindness" by Jose Saramago, a truly horrifying story of a country beset by a sudden blindness disease (an unusual blindness where the victims see bright white light, not blackness, seemingly retaining the sensation of being able to see without being able to make out the world they live in). As the entire country quickly slips almost universally into this terrible state and chaos and mayhem results, the author mines the nature of humanity and human society. Mr. Saramago, a survivor of dictatorship in modern Portugal, seems to say that the fabric of society rips terribly when we go "blind". At the end of the novel, sight returns to the nation, just as Portugal returned to democracy from dictatorship. Why did the people in the novel go blind? One character reflects at the end of the book: "I don't know, perhaps one day we'll find out, Do you want me to tell you what I think . . . I don't think we did go blind, I think we are blind, Blind but seeing, Blind people who can see, but do not see." I hope you won't consider it trite when I assert that a similar argument could be made about the conditions leading up to the passage of the CPSIA. We can only hope that the blindness will lift soon, as it did in the novel. Congress did not invent product safety and cannot supplant the good efforts and commitment of businesses focused on their customers in the children's market. When eyes open up again and the CPSC has its power to regulate restored, we will all have a fighting chance to resume doing good business safely and appropriately. June 1, 2009, 12:45 p.m. I am a toymaker and I do not make “toxic toys.” I never thought I would have to make that statement, but unfortunately, all children’s products companies remain under assault by consumer groups capitalizing on a notorious series of toy recalls in 2007 and 2008 to propagate misconceptions about safety. Having pushed Congress to pass the Consumer Product Safety Improvement Act last year, these same groups now refuse to acknowledge the flaws in this law. Despite an outcry over the overly broad reach of the new law, a misguided labeling policy and the devastating retroactive application of the new standards, Congress has refused to budge. Politics has taken over children’s product safety. While other product defects resulted in recalls of toys and other children’s products in 2007 and 2008, the fact remains that toys and other children’s products are not “toxic” and 99.99-plus percent of the many millions of children’s products (apparel, footwear, toys, books, bicycles, pens, electronics, bedding and so on) will never be recalled for any reason. Smearing our industry with allegations of toxicity spreads unjustified fear, talks down our businesses and our future, and victimizes legitimate, responsible businesses. Consumers also suffer as good products and good companies exit the market under withering attack. The problem began when Congress usurped the CPSC’s role in making safety assessments. Despite regularly lauding the performance of the professional staff at the CPSC, Congress limited the agency’s discretion by imposing inflexible “one-size-fits-all” standards to a broad class of products cutting across many markets. As implementation of the new law became mired in stays and disputes over “unintended consequences,” the consumer advocates and their supporters on Capitol Hill faced an ironic dilemma — their long-anticipated new safety law was turning into a system of noncompliance. Yet instead of acknowledging the problems with the law and opening it up for reasonable fixes, the CPSIA backers stood their ground and implicitly defended a potentially unsafe legal environment where real bad guys may go free. Their legacy of landmark legislation has degenerated into a fracas in which neither safety nor the integrity of the market for children’s products is a primary concern. The environmental and consumer groups promote the concept that American safety laws need to operate on a “better safe than sorry” basis. If 99.99 percent of all children’s products are safe (not subject to recall) in an active period like 2007-2008, how is a change to a different form of “precautionary” law going to make children safer? If the track record of the agency is to recall products in anticipation of injury, haven’t we already benefited from more than enough precaution? Even the distracting contention that implementation problems have been caused by the acting CPSC chairman is not supported by the record. Until the May 13 split vote on tracking labels, the two commissioners (Democrat Thomas Moore and Republican Nancy Nord) voted together on every previous CPSIA ballot (23 in all). It’s time for the politics of safety to take a backseat to effective safety administration. The fundamental flaw of the CPSIA must be corrected, namely that the responsibility for determining whether products are safe or unsafe should be restored to the experts at the CPSC. Wasteful provisions like tracking labels and retroactive application of the new standards should be dropped, and penalties should be refocused on truly bad acts, not on technical violations that discourage commerce. Congress should take this action promptly to restore order to the marketplace and empower the new commissioners to do their job of protecting children. With an ability to focus its considerable resources according to risk of injury, the CPSC can again establish rationality and predictability as a hallmark of American safety regulation.